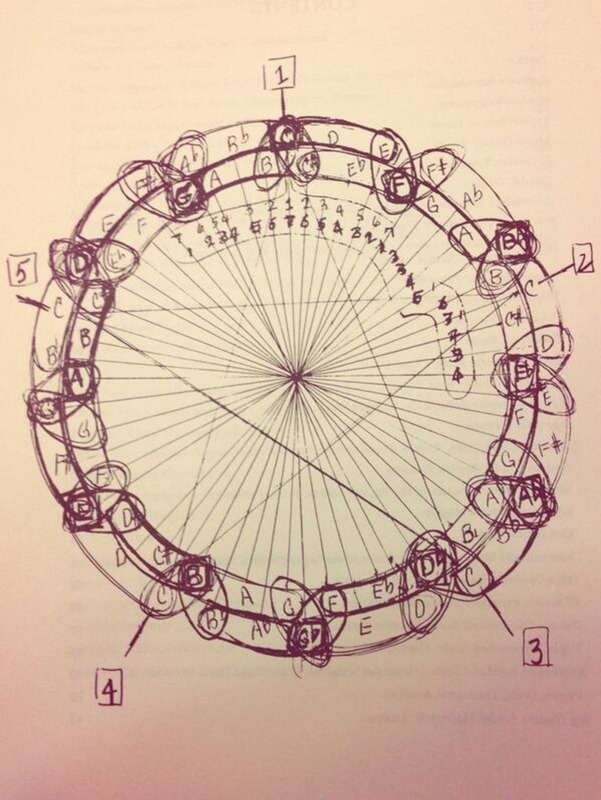 Two days ago, I began looking at a diagram that John Coltrane drew and gave to Yusef Lateef. In looking at the diagram, I attempted to discard any prior "knowledge" or learning that exists for Coltrane's work, and just derive the meaning of the diagram from what is actually in the diagram itself. 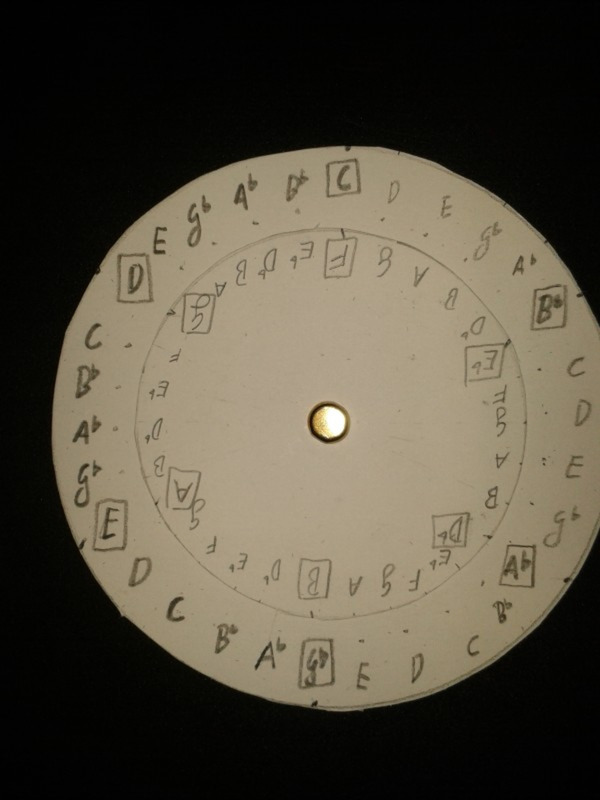 From this derivation, we can then connect the dots with what Coltrane played and think about his intention. As to when Giant Steps was written I've read that he was working on it five years before he recorded it... that might or might not be true. Benny Golson and Trane had the same teacher, Dennis Sandole, who also taught many others significantly Michael Brecker and Matthew Shipp. If you look at the chart and the derived cycles and check how the voice leading works for all of the alternative subs or super-impositions (for me I prefer the term multiplicities), for example over C7 (E7 A♭7) leading to Fmaj, they produce distinct colours and melodic contours. Looking at the diagram again, you notice how Coltrane repeats the whole tone scales to connect the "main" pitches? For example, in the outer ring the main pitches are C, B♭, A♭, F♯, E, D, going clockwise. Each of these main pitches is connected by the reversed sequence of the same notes [so D, E, F♯, A♭, B♭, C]. The repetition of pitches gives a sense of self-similarity, which Cleveland Watkiss alluded to. The "reversed sequence" [which is an ascending whole tone scale] is repeated five times within the diagram, and in the context of the circle this repetition forms a cycle. The visual pattern maker Sarah Knight looked at it and clearly stated that she'd define a "grid" first, dividing the sections into the relevant equal parts. Sarah picked up on the star that highlights the five C's as the grid, which if you look at it from the perspective of the circle of fourths/fifths, is unexpected: but from a perspective of repeated whole tone scales actually makes a lot of sense [but would this be harder to draw?]. To Sarah, the anomaly in the pattern that I pointed out looked like a mistake; and according to the second picture, I now think it is. I think Coltrane was using these mathematical principles to find truth; he was using geometry to create a musical system that connected with The Divine. A system that, due to its mathematical generation, was of The Divine and from The Divine. This feels quite Islamic to me, which makes a lot of sense, considering where Coltrane was at, and where he was going. For me, this also explains the "mistake"; in keeping with Islamic design, art and architecture, this has been added as a sign of respect, as only Allah is perfect. 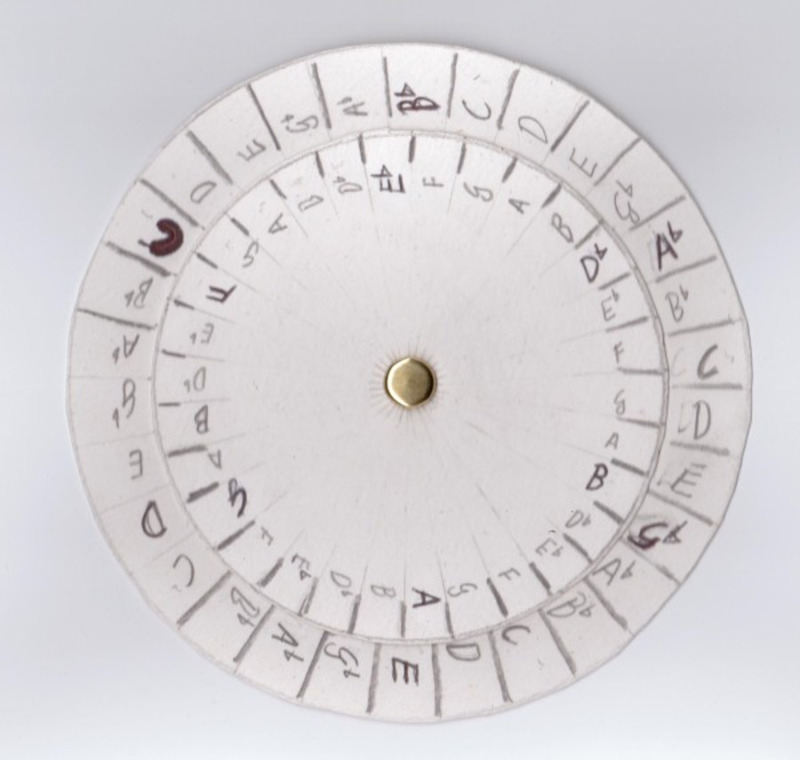 But what Sarah also noticed was that the handwriting of the innermost numbers, the numbers marking out the C's and the note encircling lines and the inner encircled notes looks different to that of the main and subsidiary pitches. I had totally missed this. It's possible then that Lateef annotated this diagram after he received it. Lateef was exploring Islamic-based spirituality before Coltrane and fits in with Arun's idea very well. I made some attempts yesterday at unwrapping the circle and dividing it into five sections; but I'm not finished with this yet. I do have another idea, which I think I'll do now and post in the comments when it's done. But it's thoroughly enlightening to examine this drawing in new ways. This is the presentation of that other idea I spoke about. Have you ever seen one of these before? It's on my desk. It's a weather forecaster. 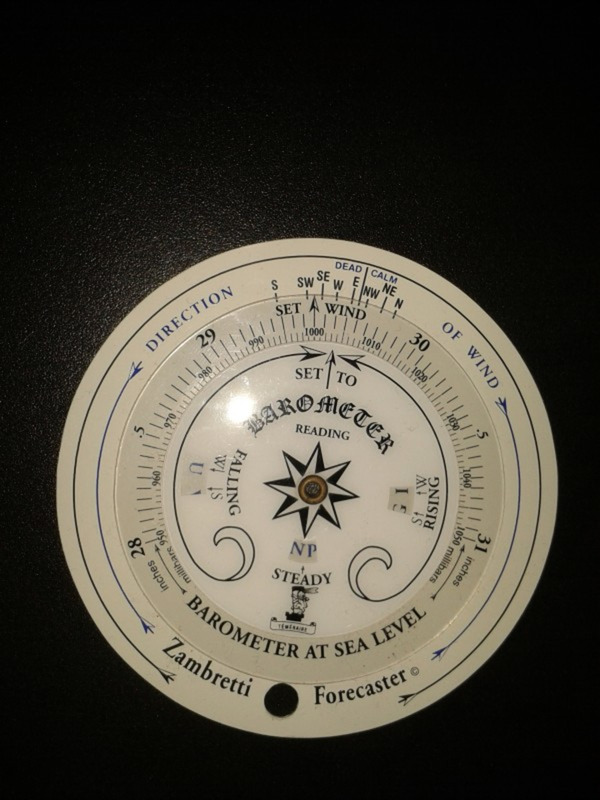 To make it work, you deduce the direction of wind, get an atmospheric pressure reading and turn the discs accordingly; it then gives you two options as to how the weather might be depending on whether the pressure is falling or rising. This gave me the idea of making this. As you can see, it's quite rough and ready. But it gives another way of seeing the original diagram. 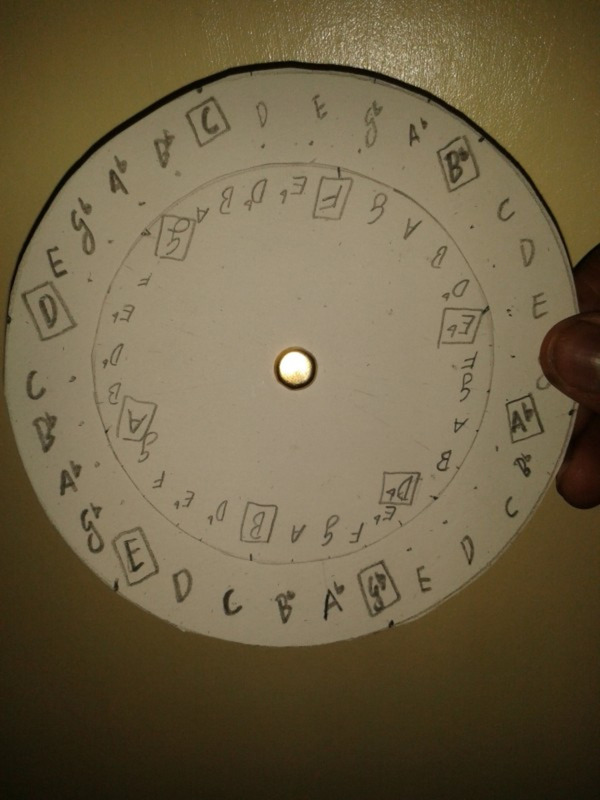 In the above picture, I hope you can see that the inner disc is spun to match the layout of the diagram. Being able to turn the inner disc means you can examine different multiplicities. Below, I've set the modeller to match a Satellite alteration. Transforming the diagram into a three-dimensional object is not necessarily what Coltrane did or meant. We currently have no way of knowing if he saw the system as non-static: this is where I have taken a "leap of logical faith". I believe that the diagram is only one of several workings out that Coltrane may have sketched. From what he said in his Downbeat article, Coltrane was working on stacking chords. But he was still experimenting: so logically, it follows that he modelled these possibilities in many ways with pen and paper. The original diagram is not necessarily the totality of his system of the time. Here's a slightly improved model, with the pitches written radially. With the layout above, part of the sequence of Central Park West appears. But I suspect this is actually a coincidence rather than a design. Draw two circles on the card, one bigger than the other. Use the protractor to mark every 12 degrees around the circumference of each circle [or use the compass, if you know how and have time]. 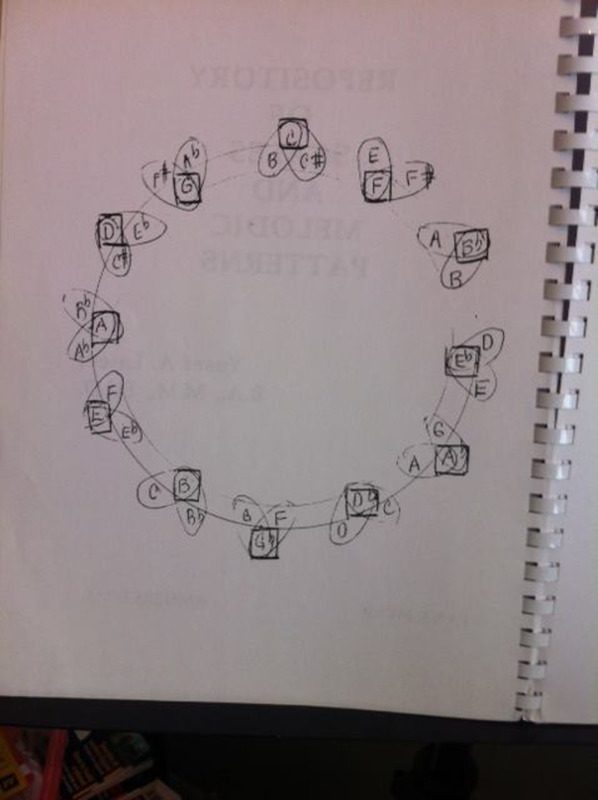 Then draw diameter lines through the circle from each mark. This will give you thirty segments. Cut the circles out and pierce the smaller circle through its centre with the split pin. Then pierce the larger circle. I have written a third part to this.